A new study by Roy Morgan Research has confirmed Telstra as easily Australia’s top telco; however, not in Sydney where, interestingly, Vodafone was top dog. The study found among all of Australia’s 18,775,000 mobile owners (aged 14and over), Telstra is the clear number one mobile service provider, which 43.6 per cent use for a mobile phone. Optus was second with (24.1 per cent) and Vodafone (18 per cent). However, it found almost two-thirds of Australians (and mobile phone owners) live in one of the mainland state capitals- where competition between the three network operators is much more fierce (and diverse). 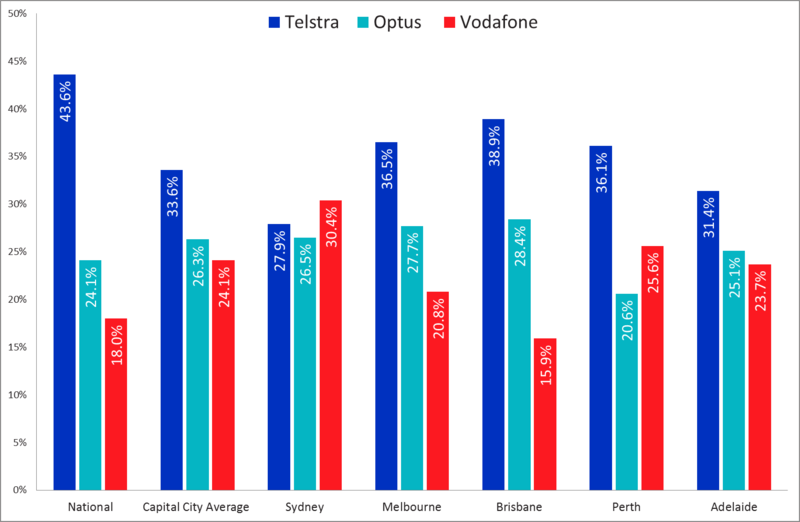 Across these five cities, Telstra claims only around one in three mobile owners overall (33.6 percent), a full 10 percentage points below its national share. Some of Telstra’s metropolitan loss becomes Optus’s gain (up to 26.3 per cent), but Vodafone is the biggest winner, with a mainland capital city market share of 24.1 percent. Yet, Roy Morgan found not all city folk are alike. Telstra maintains its position atop the dais (but with varying leads) in Brisbane, Melbourne, Perth and Adelaide – but is relegated to silver in the biggest market of all: Sydney. Instead, more Sydneysiders prefer Vodafone (30.4 per cent), ahead of Telstra (27.9 per cent) and Optus (26.5 per cent). Sydney is also the most closely fought market, with less than four percentage points separating the three competing providers. Vodafone is least popular in Brisbane (15.9 per cent) and Melbourne (20.8 per cent), where both Telstra and Optus are at their strongest. Optus’s market share is comparatively consistent across most capitals, within a percentage point of its capital city average. The anomaly is Perth, where only 20.6 per cent of mobile owners are with Optus—bumping it down to third. Commenting the on the study, Roy Morgan CEO Michele Levine said: “Sydney is worth over $2.6 billion dollars a year to mobile service providers, and the big three network operators between them own 83.3 percent of the market. Competition is at its peak in Sydney: Telstra would only need to steal 50,000 Vodafone customers to claim the lead—and Optus need only win 27,000 of Telstra’s to bump the national provider down into third spot. “Although there are some differences between mobile owners Sydney and other capitals in terms of how they use their phones, whether it’s for mainly business or personal, what they want in service providers, and their cultural backgrounds and demographics, Vodafone’s market lead in the city is particularly anomalous—but perhaps has a simple explanation. “Roy Morgan’s analysis indicates that traditional retail reach is an important piece of the puzzle. Almost three in five mobile owners in Sydney purchased their current mobile plan from a store, which is the same proportion as in Melbourne, where Vodafone is a distant third. “Vodafone’s share of owners and their dollars in each city is actually remarkably similar when looked at ‘per store’. That is, while mobile owners in Sydney and Melbourne equally prefer to buy their plans in-store, Vodafone has just over 50 percent more stores in Sydney—so it is any wonder its share of the market (and revenue) is also just over 50 percent higher? “In both Sydney and Melbourne, Vodafone has just over 7000 customers per store, worth around $430,000 a month,” Levine said.